That’s one sweet looking guitar! The dynasonicsbare really a great sounding pickup. Billy Zoom can’t be wrong about that, right? That is one sweet looking guitar. Dynas are my favourite pickups. Man, I so wish I had Dynas in mine!!! MAAAAN, I am in AWE of that piece! That's beautiful, congrats! It's hard to say just by the pics, but if you're having issues with the neck angle, you may need a reset. It's pretty common on these. Mine was borderline, and so I opted not to have it done, and it played fine. Yours is in great condition. I guess having one owner all its life has been good for it. I love the sound of those pickups, too. Mine had the mini-humbuckers, which were great, but I always preferred the look and sound of the Dynasonics. Just got back from the tech - he says it's possible it needs a neck reset. The neck is pretty high up along with the action, and the strings are already really close to the bridge pickup. Turns out the strings on it are 13-56 flatwounds, so gnarly. He's going to do a set up with 11-49 roundwounds and see if maybe the relieved tension from taking those huge flatwounds off is enough to bring the neck down a bit and give us some more room to adjust it. It's playable as it is, so hopefully it will be more playable afterwards and we can put off the neck reset for a while. He did say he doesn't feel quite comfortable with doing the reset anyways as he's done plenty of acoustics, but never one of these old guilds. There's no cap at the neck joint, it looks like it's all one piece so he's not certain how he could go about it and is hoping we can avoid the reset. I trust my tech, he's great at what he does and has been doing it for a long time, but might consider looking to someone more versed in these old Guilds if it comes down to it just to be safe. Has anyone here had a reset done? Or know a tech who is well experienced in doing these on old Guilds? I took my Guild to 2 techs I trust, and neither of them were too excited about doing a reset on it. Apparently there’s something about the type of joint and the glue they originally used, along with the paint that makes it harder than others to repair? As a compromise, we ended up pulling the frets and planing the fingerboard slightly to make up for the loss of angle (the neck joint was solid, so that wasn't an issue), and then refretting the neck. I have to say, it was well worth it. 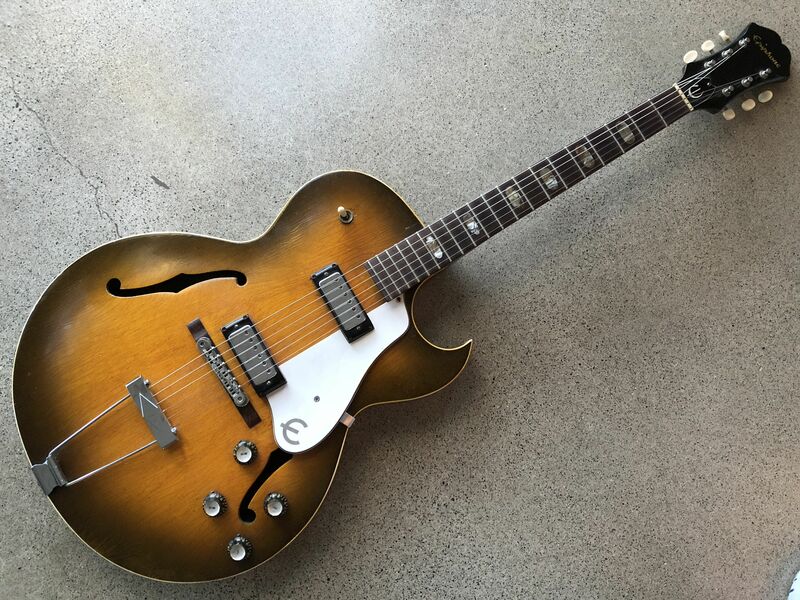 My 1954 Gibson ES125 needed it pretty badly, as well as the fingerboard plane and refret deal mentioned above (it had a fairly severe hump around the 14th fret where it met the body). IIRC it cost me about $600 to do all that work. Fairly steep, but then I'll probably be buried with this guitar. The other is actually currently still underway. I bought a 1966 Epiphone Sorrento that wouldn't keep a setup. I took it to the tech and we found out someone had "fixed" the loose neck with a couple drywall screws and putty'd over the holes to hide the evidence. Sufficed to say, I'm not happy about it, but it's being resolved as I type this. The luthier is building a new dovetail joint (on both neck and body), and grafting a new heel to repair the hole-ridden one that was there before. Obviously it will take some refinishing and color matching in the end to hide the repair. Honestly I'm a bit nervous what this will end up costing me, but the guitar sounds and feels so good it seemed worth it. I'd suggest talking to the folks at letstalkguild -- that board has some amazing experts on there (and all are helpful). They should also be able to date your guitar accurately (Hans Moust literally wrote the book on Guilds and has somehow figured out their weird serial number system. Somehow). Congrats, that looks absolutely amazing! Hopefully you can get it in a happy place sans reset w/ the lighter strings. Went ahead and posted it there too! Thanks for the suggestion. Gotcha. I may mention the fretboard planing along with a refret. Sounds like a refret is usually necessary with a neck reset anyway. Overall well worth it. We'll see what happens this week, I may end up sending it off just to get it over with and into as good of shape as possible. The 125 is nice, but damn that Sorrento looks good. That drywall screw/putty situation sounds terrible. Poor guitar. I hope you can get it back in your hands soon! Looks amazing and I'm sure if it sounds nearly as good as it looks, it's a keeper for sure. A starfire III with Dyna's, and a rat through a small danelectro combo and you can cop the sounds from the first CAKE album. Det er mig der holder træerne sammen.